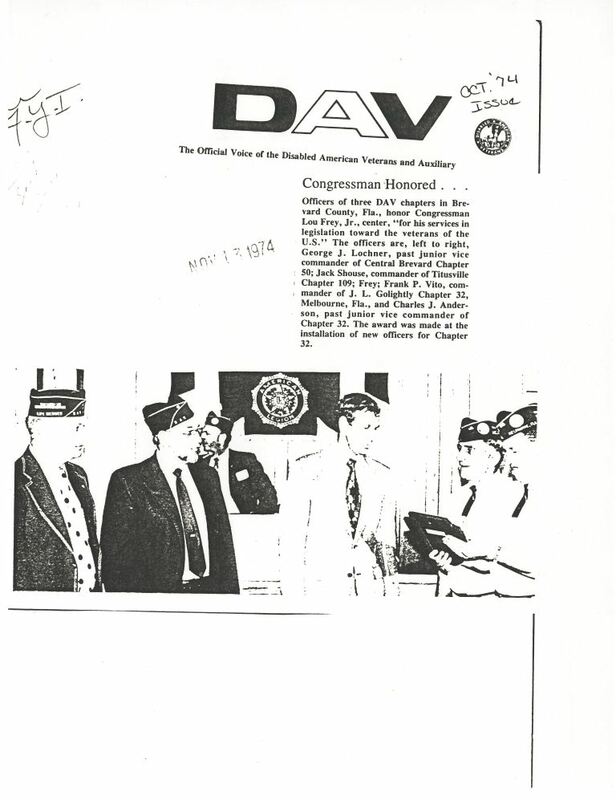 One page of a newsletter published by the organization of Disabled American Veterans (DAV) containing an article about an award given to Representative Louis Frey, Jr. (1934-), who served in the U.S. House of Representatives from 1969 to 1979. He was on several committees during his time in office, including the Select Committee on Narcotics Abuse and Control and the Science and Technology Committee. He was also the chairman of the Young Republicans of Florida. This award was given for Congressman Frey's legislative efforts in the House of Representatives to advocate for veterans' issues. Some of these issues included World War I veterans' compensation, veterans' education benefits, and pensions. Additionally, Rep. Frey focused his efforts on advancing Central Florida's medical facilities for veterans by introducing several bills into Congress during the 1970s that would have called for the creation of a Veterans' Administration hospital in Brevard County. Photocopy of original newsletter, October 1974: Lou Frey Papers, Clippings Binder, Lou Frey Institute of Politics & Government, Special Collections and University Archives, University of Central Florida, Orlando, Florida. Digital reproduction of photocopied newsletter, October 1974. Lou Frey Papers, Clippings Binder, Lou Frey Institute of Politics & Government, Special Collections and University Archives, University of Central Florida, Orlando, Florida. Originally published by the Disabled American Veterans. Copyright to this resource is held by the Disabled American Veterans and is provided here by RICHES of Central Florida for educational purposes only. 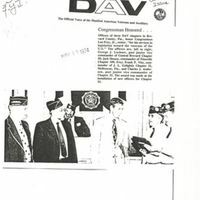 Officers of three DAV chapters in Brevard County, Fla., honor Congressman Lou Frey, Jr., center, "for his services in legislation toward the veterans of the U.S." The officers are, left to right, George J. Lochner, past junior vice commander of Central Brevard Chapter 50; Jack Shouse, commander of Titusville Chapter 109; Frey; Frank P. Vito, commander of J.L. Golightly Chapter 32, Melbourne, Fla., and Charles J. Anderson, past junior vice commander of Chapter 32. The award was made at the installation of new officers for Chapter 32. American Legion; Anderson, Charles J.; Brevard County; Central Brevard Chapter 40; DAV; disabilities; disability; Disabled American Veterans; Frey, Lou, Jr.; Frey, Louis, Jr.; J. L. Golightly Chapter; Lochner, George J.; Melbourne; Shouse; Titusville; Titusville Chapter 109; veterans; Vito, Frank P.
“DAV: The Official Voice of the Disabled American Veterans and Auxiliary, October 1974.” RICHES of Central Florida accessed April 21, 2019, https://richesmi.cah.ucf.edu/omeka/items/show/3660.